By incorporating these Anti Inflammatory Foods into your diet everyday and cutting out the Pro Inflammatory Foods such as processed sugars and unhealthy fats, you can eat well and prevent disease. You have everything to gain by trying out a Anti Inflammation Diet today! Inflammation is a key contributor to many diseases, it is especially harmful as we age. Preventing inflammation with a natural diet will reduce your risk of Cancer, Heart Disease and Liver Disease. Promoting total well being and allowing you to age free of disease and discomfort, boosting energy levels and brain health. Kelp contains a nutrient called Fucoidan which is a great anti inflammatory. While the entirety of the mechanisms responsible for its anti inflammatory characteristics are still not entirely understood, it is known that it does possess these mechanisms in abundance. Reducing inflammation through suppressing Nuclear Factor-Kappa B or NF-kB activation, a leading contributor to inflammation. Studies have also indicated it’s potential for anti tumor (preventing metastasis), antiangiogenic, antiviral, neuroprotective, radio-protective, and anti ulcer effect. Aside from the immense anti-inflammatory benefits of Fucoidan, it is one of the best things to add into your diet or supplement program for the huge concentrations of antioxidants and minerals. Incorporating brown seaweed into your diet will increase your immune function, cellular health and provide key nutrients scarcely found in foods. Nutrients like Iodine, essential for our hormone balance and thyroid health, a mineral that over 30% of us are deficient in. Cooking with Turmeric has immense anti inflammatory benefit. It harbors numerous anti inflammatory compounds, most importantly Curcumin. Curcumin is extracted from Turmeric, roughly 5% of Turmeric is Curcumin. It is also fat soluble so it must be consumed or supplemented with a fat or oil of some kind. Turmeric and Curcumin have such powerful anti cancer, antioxidant and anti inflammation abilities that they have been the topic of study for many medical studies. What is less publisized is the fact that you can increase Curcumin C3 absorption by 20 times with the addition of BioPerine. A fantastic combination, clearly proving the powers of synergistically compounded ingredients. Supplement smart and you can amplify the benefits greatly. Wild Salmon is a great source of Omega 3 oils, a healthy fat that is essential in our diet for healthy cellular function preventing inflammation. It is vital we stress the importance of Wild Salmon over conventionally farmed salmon. The diet of a wild salmon differs greatly from that of a farmed salmon who will be fed un-natural corn byproducts. Wild salmon are rich in antioxidants like Astaxanthin and Omega 3’s due to their diet of Krill, Algae and small fish. The nutritional benefits are incomparable between the two, wild salmon is the clear choice if you are taking your health into consideration. The powerful antioxidants and Omega 3 oils will prevent inflammation by improving cellular function and allow for proper cellular metabolism. This will improve cellular health and the ability for the immune system to function, reducing inflammation and preventing chronic inflammation from causing serious harm to your health. Green Tea contains a powerful antioxidant known as Polyphenols, these antioxidants have great anti inflammation abilities. Flavonoids are another natural antioxidant group found to be potent anti-inflammatories, reducing the risk of heart disease and cancer as many studies have found. Quite possibly the most ancient health tonic known, used for thousands of years in the East, recently adopted and studied by North Americans. This is a piece of the secret behind the longevity and long lives of many Asian communities who consume green tea daily. Blackberries, Raspberries, Blueberries and others have a huge payload of super antioxidants and nutrients. Phytonutrients that have fantastic anti inflammatory properties. Rich in fiber and easy to incorporate into nearly any dish or delicious as a snack all by themselves. Berries are a great way to protect against inflammatory related diseases such as dementia, cancer and liver disease. Be sure to buy organic though. Conventionally grown berries have pesticides that can negate the benefits and actually do harm to your body over time. Cauliflower, Kale, Cabbage and other nutrient packed cruciferous veggies are fantastic natural anti-inflammatories. Aside from the great nutrition and fiber these delicious veggies contain helpful antioxidants that will reduce inflammation and promote a healthy immune response. Cruciferous vegetables are among the healthiest things to incorporate into our regular diet, many of our dietary vitamins and minerals are obtained from eating these Super veggies. Sweet potatoes are jam packed with nutrients and fiber. With so many different ways to prepare sweet potatoes it is simple to add in to anyone’s diet. Rich in nutrients like magnesium, Vitamin B6 and Vitamin C. Beta Carotene is found in abundance in this super food, a powerful antioxidant and precursor to Vitamin A synthesis in our bodies. Additional antioxidants such as Alpha-tocopherol and ascorbic acid contribute to sweet potatoes anti inflammatory abilities. Proven to be effective in the treatment against osteoarthritis. Try to incorporate greens into every meal throughout the day, they are extremely important to have in our diet. Rich in nutrients, minerals and Phytonutrients, these leafy greens are fantastic sources of antioxidants which are effective in reducing chronic inflammation and improving cellular health. Spinach is a great leafy green to add into your diet, not only will it help reduce inflammation throughout the body, but just like Popeye always seemed to understand, it gives your muscles a huge boost! Phytoecdysteroids found in highest concentrations in spinach have been found to increase protein synthesis by up to 20%, allowing faster muscle growth and recovery while preventing disease and inflammation. 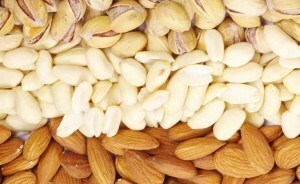 Nuts are rich in calories, healthy fats and nutrients, a great addition to your anti inflammatory diet. Snack on almonds, walnuts or pistachios regularly to lower cholesterol, improve joint health and reduce pain and inflammation. A source of unsaturated fats, omega fats and dietary fiber, certain nuts such as the walnut contains further benefits such as Alpha-linolenic Acid and Phenoic antioxidants, proven to increase your overall health and reduce inflammation. By replacing fats like Canola Oil and Margarine with Healthy Fats like Extra Virgin Olive Oil or Coconut Oil (ensuring cold pressed varieties) you can greatly benefit your health. Unhealthy fats cause inflammation and wreak havoc on our health, while Healthy fats do quite the opposite. Healthy Fats are responsible for many crucial bodily system functions, preventing inflammation and improving cellular energy transfer to treat the cause directly. Chronic Inflammation is a leading cause of nearly every health condition and disease. It is a key factor in Cancer growth and development, also the root cause of many common ailments such as Asthma or Arthritis. Inflammation is the cause of your Chronic Pain, all while taxing your immune system greatly. Leaving you vulnerable to infection and disease from an outside contaminate. This diet guide is simply that, a guide to eating healthy while reducing the risks and causes of inflammation. This is very important as we age, but also very beneficial to adopt at an early age to improve energy, longevity and future risks of developing health issues. It may not be realistic for you to simply stick to the top 10 list of anti inflammatory foods, carbohydrates and sugars are a part of daily life. Look out for the bad carbs and refined sugars, replace them with more natural alternatives such as whole grain flours and natural sweeteners like honey or our favorite sugar alternative Xylitol. The key to success when dieting is finding how it can work for you, incorporate these foods as often and as much as you feel comfortable. Get creative with it, create your favorite Anti Inflammatory recipes and avoid the monotony of most diet programs. Supplementing is also a great way to incorporate the beneficial nutrients of these foods into your day through a pill or capsule. Supplementing Anti Inflammatory nutrients is the best way to boost their benefits and ensure you are achieving optimal levels of each essential nutrient. Omega 3’s are a great supplement to take everyday to ensure you are getting the full benefit without having to eat fish everyday. Many natural supplements are available to boost levels of Fucoidan, Turmeric extract known as Curcumin C3, Green Tea’s Polyphenols and the Vitamin medley Vitamin B6, C and magnesium from sweet potato’s. Foods containing these powerful Anti Inflammatory nutrients are beneficial to incorporate into our diet, but the nutrient value is often too small to show the true benefits. Going beyond the multi-vitamin on the shelf and supplementing smart can yield remarkable results, improving total immune function and maximizing disease prevention. Improving energy, longevity, cognitive function and mental alertness. Achieve your peak performance by providing your cells with the natural nutrients they require to work as they should.